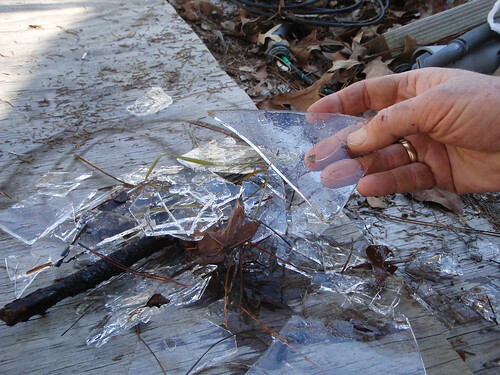 Picture of icicles from roof to ground taken in Lancaster, NY by John S. Quarterman. The homeowner removed them later with a hammer. Picture of icicles on a motel near Cincinnati, Ohio, 23 Dec 2010 by John S. Quarterman. Model: Gretchen Quarterman. 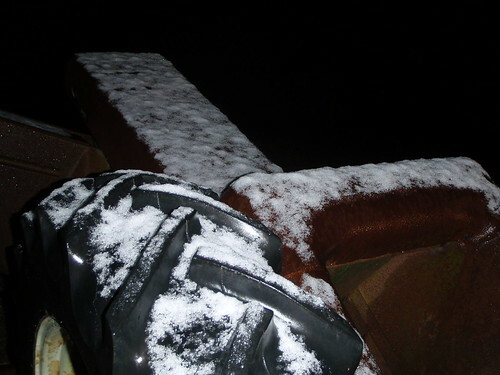 28 F at 5AM this morning; 29 at dawn. 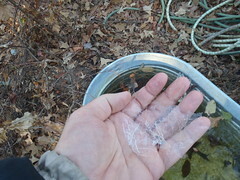 In the dog watering tub, a layer of ice, some in my hand here. Pictures by John S. Quarterman, Lowndes County, Georgia, 7 Dec 2010. It's October, so Gretchen is wearing sweater and sandals. "At the bottom of the profile, I found lots of huarango pollen. This indicates that large forests were originally growing in that area. Subsequently, I saw cotton pollen and other weeds, but still a lot of huarango pollen. It seems at this stage farming was in balance with the environment," Chepstow-Lusty said. Then, about 400 A.D., the Nazca apparently stopped growing cotton, switching to large crops of maize. 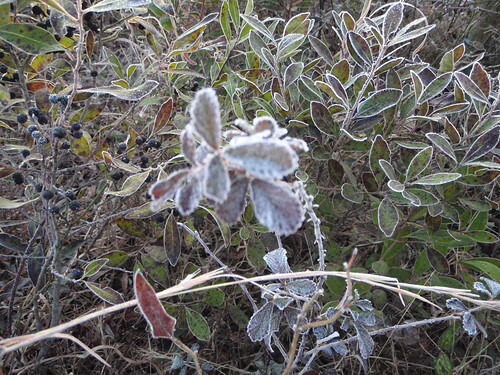 The researchers found a major reduction of huarango pollen, indicating that people started clearing the forests to plant more crops. But the agricultural gain from clearing forests was short-lived. When a mega El Nino event hit the south coast of Peru in about 500 A.D., there were no huarango roots to anchor the landscape. The fields and canal systems were washed away, leaving a desert environment. Today, only pollen from plants adapted to salty and arid conditions can be found, Chepstow-Lusty said. "The bottom line is that the Nazca could have survived the devastating El Nino floods had they kept their forests alive. Basically, the huarango trees would have cushioned that major event," Beresford-Jones said. Hm, around here we've only seen a 700-year flood last year. When it happens again in a year or so, what will we call it? Rain pouring through window, Nashville, Tennessee, 2 May 2010. 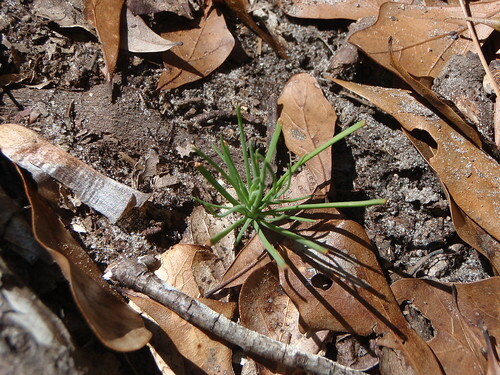 Many people think it takes fire to make longleaf produce seeds. These pictured seedlings came from a tree that hasn't had fire near it for more than ten years. So why so many seedlings this year? Picture by Gretchen Quarterman, 8 Feb 2010, Lowndes County, Georgia. Pictures by Gretchen Quarterman, Lowndes County, Georgia, 6 Jan 2010.